Observers from pre-industrial times could only imagine the world-changing possibilities lying dormant in the pent-up energy of ancient rocks, or the remains of long-dead flora and fauna. Only a visionary few came close. For most, the health, wealth and material abundance made possible by an industrial economy was simply inconceivable. But when that access was finally granted, things moved fast. From the spinning jenny to jet airplanes, moon rockets, instantaneous global communication and the sum total of recorded human knowledge available at the touch of a button. That early observer, looking on in amazement at our brave new world, might understandably be tempted to think we have mastered our material universe. Any justification for such conceit belies the one aspect of industrial economics that remains hopelessly un-evolved. Since the time of the spinning jenny, the foundation of a linear take-and-make economy has changed little. The exponential rise in human population and resource consumption since the start of the industrial revolution has pushed a linear economy to the breaking point. While we may choose to deny it, the clues are all around us. As our reach grows, the risks inherent in a globalized linear economy are manifest. Resource and economic shocks reverberate across the globe. This increased vulnerability comes at a price. According to a World Economic Forum study, the real cost of natural goods has trended sharply upward since the turn of the century. In 2010, 65 billion tons of raw materials entered into the economy, most of it relatively quickly used up and ultimately headed out the other end: as a growing flow of waste streaming into the environment. Global resources, like forests and oceans, swallow an ever-bigger hit of the detritus. If ignored, the miracle of latent energy, of our brave new world, becomes a curse. Meeting needs becomes subsumed by feeding demand. Citizens become consumers. Satisfying consumer demand makes the world go ‘round -- at least economically speaking. Consumer sovereignty remains a bedrock principle of modern mainstream economic theory. Competing in a complex consumer-driven (or, more accurately, manipulated) economy only ups the ante for more unsustainable consumption and a global marketplace awash in products and packaging. Well-established research indicates that beyond a point all this consumption adds little to human well-being. What is the point of all this production and consumption if it does not ultimately lead to human well-being on a healthy planet? How do we break the cycle? Savvy business leaders, policymakers and citizen-consumers understand the restraints implicit in a linear economy. But change is hard, and you never know what the future holds. Sustainability standards such as GRI Standard make important inroads for rigorous transparency, measurement and reporting of non-financial, triple-bottom-line metrics. But where GRI’s protocols have evolved over nearly 20 years, adopting similar methodologies for closing the gap between resource inputs and waste outputs is in its infancy. How do we translate the aspiration for a more circular, regenerative economy into real, hard numbers? It's the same old adage: Without a way to measure, how will we really know when we’re making any headway? Lucy Chamberlin highlighted this challenge in the Imperial College of London’s blog Aspects of Environmental Research in 2013, asking: “How do organizations know when the goods they have produced will reinforce a restorative or regenerative system?” Adrian Wain, a sustainability consultant and business advisor for UL EHS, concurs. In terms of a standardized set of metrics for circularity,“there isn’t much out there,” Wain told TriplePundit in a recent interview. "There are very few people thinking about this yet." But that's not to say there isn't traction pushing it forward, aided by some of the brightest minds in the field. "It's a very exciting space," Wain told us. "I am glad to be working with some of the best thinkers on this, and we're making some good progress." In Wain's view, real traction for developing measurable circular business methodologies began around 2015, arguably a banner year for sustainability in general. After Accenture released its Waste to Wealth report, the work of the Ellen MacArthur Foundation, companies like Phillips, H&M, Levis and many others decided circularity "is the direction of travel for us,” Wain said. Businesses are looking for direction, he told us, and we want to"help them on their journey." The Circularity Indicators Project is the first big step forward in putting actionable circularity metrics in place. Developed by the Ellen MacArthur Foundation and Cambridge-based Granta, the project deploys the Material Circularity Index. On a scale from 0 to 1, the MCI measures how "restorative the material flows of a product or company are." "It's impressive work," Wain said. "I've seen how they model it. I've seen all the formulas that feed into that number." But it's just a beginning. It's still "a very abstract way of measuring [circularity] and not necessarily applicable to a business." "We're at the point now where businesses like Granta who have a very deep materials expertise can tell you how circular your computer is from naught to 1," Wain explained. "But how do you look at a company like Dell, that might have 15,000 SKUs?" For businesses in the trenches, analyzing circularity with a single number like the MCI "isn't necessarily scalable and it's not viable," Wain argued. "It doesn't really tell them if you're at 0.8 (on the MCI scale) and you want to get to 1, what steps should you take? And that's what we're trying to figure out." It's a work in progress. In terms of practical standards for measuring and reporting for material recovery, "a big gap" remains. Nor should the focus rest solely on materials recovery and reuse, Wain insisted. Even though "the conversation is typically dominated by materials," a truly circular economy is about much more than reuse, he told 3p. "It's about digitization and servitization -- particularly the service-model piece." What do we really need: a washing machine or clean clothes? A light bulb or light? A car or transportation? In each case, a circular economy suggests the latter. Car-sharing services like Zipcar are already popular in many dense urban areas. The 'Pay-per-lux' lighting model, a collaborative effort between Phillips and Turntoo, is a case study for selling light as a service. As for clean clothes, Wain asked: "How attached are you to your washing machine?" (personally, not very). In terms of products as a service in a circular economy, these are among the lowest hanging fruit. "It's a utility, it's something that provides some function that we use in our day-to-day life." If Maytag changed its business model from selling washing machines to selling the service of clean clothes,"I think there would be very little friction from a consumer perspective," Wain said. Xerox transformed its market to a service-based business -- a model Wain argues is duplicable for other businesses facing a changing marketplace: The customer retains the benefit of the machine without the headache of maintenance; the manufacturer gets the benefit of "massive parts re-harvesting." This lowers costs for both and changes a point-of-sale transaction to an ongoing relationship. Done right, everybody wins. Instead of units sold, profitability is measured by the service the product provides. "You can think about maintenance and service as another type of [key performance indicator]," Wain told us. "Can you measure the duration of time between service intervals? Can you, throughout the process, stretch that period of time so you go to client sites less frequently, reduce the cost of service sold, and therefore improve the performance of your circular economy products?" White goods are one thing. But what about our personal devices? Even there, Wain sees potential. Even as technology companies like Apple are reluctant to let people poke around inside their devices and focus on selling the next generation in products, Apple has a stake in circular principles, Wain told us -- at least so far as their data centers and facilities are concerned. "The real driver for Apple to create something that is more robust, more future proof is that the phone is merely a portal to a range of digital services that Apple monetizes." In a "post-device world," Wain asked, "how can we just use analytics, applications, data to generate revenue, rather than selling a little device?" "I'm interested to see how they play this one." The beauty of circular, relationship or service-based business models is the measurable efficacy for both customer and business, Wain explained. Retailer H&M embraces circularity, and the key is building customer relationships. Its "recycle your clothes" program encourages brand loyalty by offering discounts on new purchases if customers bring in their old clothes for recycling (no matter the condition or brand). H&M benefits from material recovery: Thus far, enough material has been diverted from landfill to produce "100 million T-shirts," the company says. “This is an important point about the way I see circular," Wain said of the model's benefits for both companies and customers. "The better deal for the environment is, somewhat, third in this arrangement. And that’s the reason [the circular economy] is going to succeed." 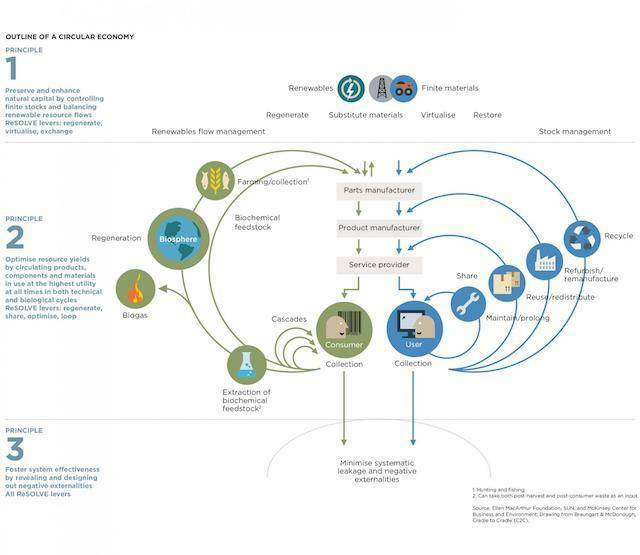 The narrative for a circular economy isn't about becoming a tree-hugger. All the "talk about a preference for sustainable products" or the "additional price elasticity for sustainable products" won't mean much if the centuries-old linear model of resource consumption doesn't evolve into our 21st-century reality, Wain said. "It's a very powerful way for our economy to grow and for our environment to improve." It is the path to prosperity. Assessing the wisdom of the entire human endeavor is far beyond the scope of this article. It is, however, safe to say we are a clever lot. As a species, we not only survive, but thrive -- staving off the dark night of a Hobbesian earthly existence that is “nasty, brutish and short.” Striving for a better life is what makes us human. The liberation of energy, labor and wealth from fossil fuels is undeniable -- for many at least, but certainly not all. Nor will it last. Our linear, globalized, carbon-based energy economy has been so successful that we are now held in its grip, mesmerized into thinking it will go on forever, but without an adequate long-term plan for how to do it. It distorts our definition of prosperity by placing an endless linear quest for "growth" central to human intent and interaction with the natural world. To challenge the efficacy of infinite economic growth is suspect, even heretical. We operate with an assumption of ever more material throughput at one end and, when we're done with it, the planet’s ability to absorb the waste at the other. A good business leader understands risk. An inspiring statesman knows how to lead. A skilled policymaker makes real the methods the will effect change. It's circular process. We approach the third decade of the 21st century at a crossroads and challenge. We learn how to thrive into a prosperous future or trot down the same old path that is, in the end, nasty, brutish, and short.